A five week long, cross-country tour featuring some of the best known and most respected figures in rock and blues has been set to celebrate the legacy and music of Jimi Hendrix. Presented by Experience Hendrix, L.L.C., the Hendrix family-owned company founded by James A. "Al" Hendrix, Jimi's father, entrusted with preserving and protecting the legacy of Jimi Hendrix together with musical instrument giant Gibson Guitar, this year's Experience Hendrix Tour represents a dramatic expansion beyond last year's seven sold out performances. Featured artists who will be performing music written by and associated with Jimi Hendrix include blues giant Buddy Guy, contemporary guitar greats Jonny Lang, Kenny Wayne Shepherd and Eric Johnson, Cesar Rojas and David Hidalgo of Los Lobos as well as Aerosmith's Brad Whitford. Janie Hendrix, CEO of Experience Hendrix noted, "Everyday, we see how Jimi's musical legacy continues to transcend generational and cultural boundaries. This tour is our way to give live audiences a concert experience that reflects the genius of his unifying spirit. Part of our mission is to share Jimi's music with audiences of all ages and these tours continue to play a key role in fulfilling that vision." Marshall Amplification will also be supporting Experience Hendrix Tour this year with a healthy supply of their top notch amplifiers including the Super100-JH stack that was unveiled at the 2006 NAMM show in Anaheim, CA. This limited edition hand wired Super100-JH stack was limited to only 600 pieces worldwide and debuted as part of the company's celebration of its close association with Jimi Hendrix. The all-valve heads and accompanying 4x12 cabinets have been crafted to recreate the exact sound and look associated with Jimi Hendrix in 1966/67. 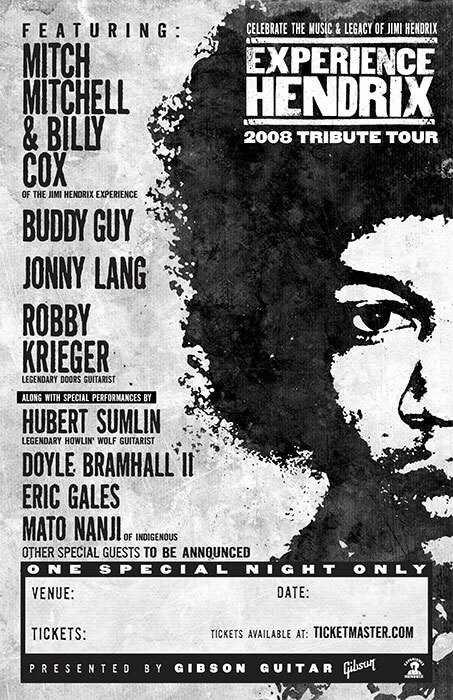 The first Experience Hendrix Tour featured Guy, Shepherd, Sumlin, Paul Rodgers, Santana as well as Mitchell, Cox and others and launched in 2004 and playing three sold-out performances in Seattle, Portland and San Francisco. The success of these performances led to a seven city 2007 tour that concluded with two sold out performances at New York's Beacon Theater. John McDermott, who manages the Jimi Hendrix music catalog on behalf of Experience Hendrix L.L.C. also serves as the producer of the Experience Hendrix tours, remarked, "With each successive tour, we've been able to showcase some of the most accomplished musicians in the world. The concerts bring together Buddy Guy and Hubert Sumlin, two legendary blues artists that Jimi admired together with the finest young guitarists performing today. We're proud to bring Jimi's music back to the concert stage in such an exciting context."